The Quick release Molle Type vest is currently in service in both Afghanistan and Iraq with Special Forces and numerous Close Protection operatives. Available in any number of pouch and colour configurations configurations. The vest also features complete size adjustment system and a innovative plate dump handle. 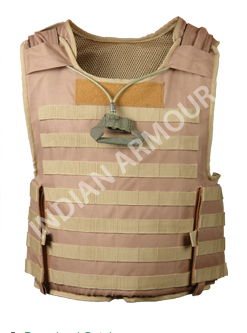 We are an iso 9001:2000 certified manufacturer of ballistic protection products like bullet proof jackets, military boots, armour plates. Our products are widely used in defense industry and for security purposes during violence and war time.